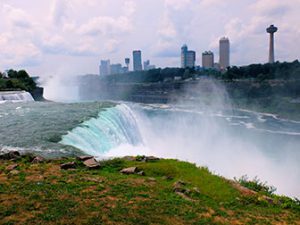 During the New York to Niagara Falls by bus day trip, you visit Niagara Falls in one day! 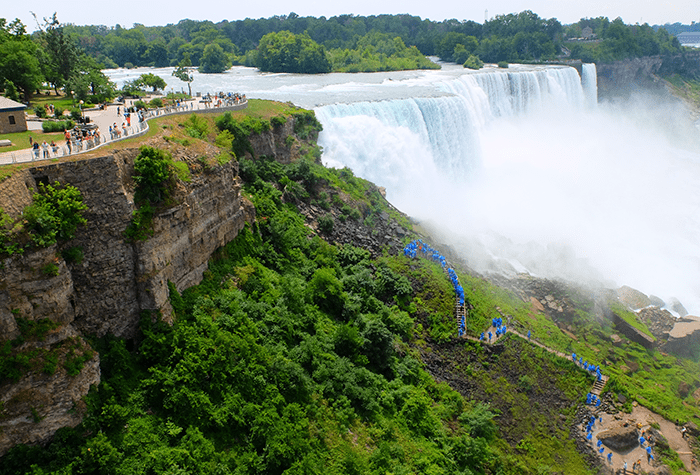 The Niagara Falls are among the largest waterfalls in the world and you can visit them during your trip to New York. Be prepared for a long day on the road, with the reward of admiring this iconic natural phenomenon. A once in a lifetime experience! 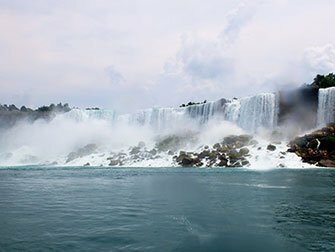 This day trip offers a unique opportunity to visit Niagara Falls from New York. You board the bus early in the morning at a central pick-up point. Depending on the traffic, the journey takes between 7 and 8 hours. The bus offers a limited WiFi connection and there is a toilet onboard. The bus stops halfway for a short break, where you are able to stretch your legs. 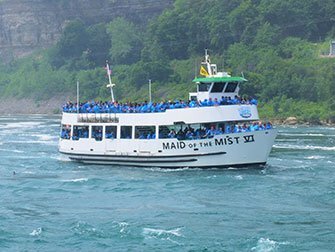 When I tested this tour, I arrived at the waterfalls in the late-morning and boarded the famous Maid of the Mist straight away (tickets can be booked directly). This ferry takes you close to the waterfalls. Everyone gets a poncho included, trust me, is not a novelty gift: the power of the water splashes you from hundreds of meters away. This boat trip is a must-do when visiting the waterfalls! After the boat trip, I had the opportunity to look around for myself and decided to visit the observation tower. This view point offers a nice outlook over the waterfalls. Are you a seasoned walker? Then I recommend making the climb to the adjacent Crow’s Nest. There are a lot of stairs to be climbed before reaching this viewpoint, but the end result is more than worth it. The Crow’s Nest is closer to the falls than the observation tower and the view is beautiful. Don’t forget your poncho; you will also get wet here! The last beautiful spot that you visit on this tour is Goat Island. This island is located in the middle of the Niagara River, between Bridal Veil Falls and Horseshoe Falls. From here, you have a completely different view of the waterfalls. Sightseeing builds an appetite! You can choose to book a lunch on the day, which consists of an all-you-can-eat buffet at one of the casino’s. The buffet offers good quality and variety, with something for everyone. Later in the afternoon you’ll board the bus back to Manhattan, where you’ll arrive late in the evening. Eric’s Tip: The schedule for this tour can vary each time. This is due to various factors, such as traffic conditions. I recommend booking the all-you-can-eat buffet in addition, as the other lunch options in the area are very limited. After purchase you’ll receive a voucher that you can print out and use as your ticket for the day trip, or show as a mobile ticket on your phone.